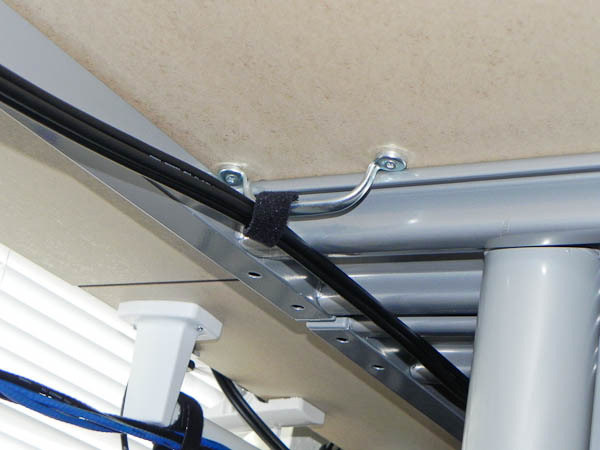 Stefan Didak – New home office cabling complete! 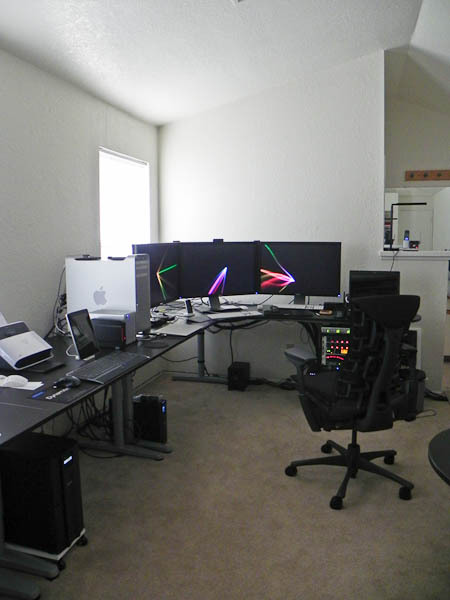 You are here: Home / Hardware / New home office cabling complete! It’s time for another installment of pictures and updates in the ongoing Office 7.0 Beta Buildup. There is good news and bad news. The good news is that I have completed the cabling of the new office (and that I got married while the cables were still shipping out to me). 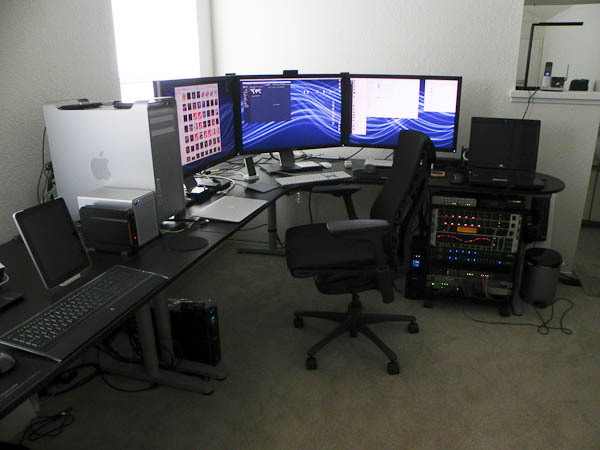 The bad news is that I am waiting for the new workstation and server systems to be completed by my new (local) dealer. I will not be making any major pages with photos until the full office is complete (and that, yes, will take some more months actually) and when I have my full camera gear with me, which I do not at this time. But just to give everyone who’s been asking an update of how things are looking, here you go, a whole page with pictures. Made with Sallie’s Nikon P100. I swear, large heavy cameras just seem to work better for me than the ones with a ton of cool features and are light enough to swing from your pinkie. Some of the images might look a bit familiar to all of you who follow me on Twitter. Let’s start with a general overview of the space and the current situation. The chair is a Herman Miller Embody, the successor of the Aeron. I loved the Aeron. But I like the Embody better. However, as always, check out a chair before dropping serious cash for one because it may not fit you as well as it fits me. It also requires a bit of actual use before you can really tell if a chair works or not. 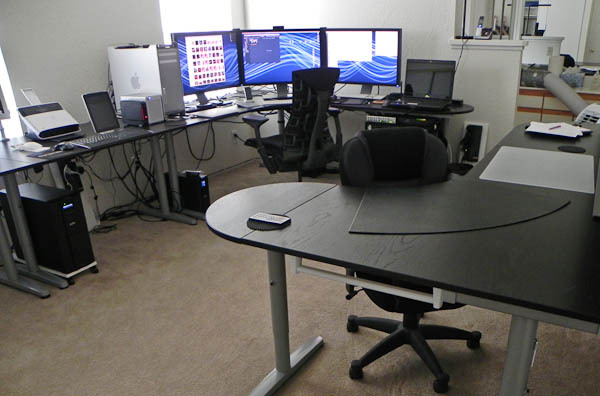 I prefer the air-ness of the Aeron but I often banged my elbows into the hard edges. 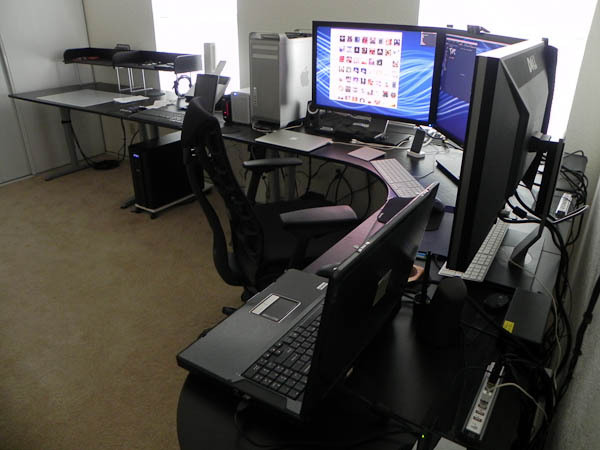 Of course, once my other stuff gets here I’ll probably switch between chairs quite a bit. The Best in the corner of the picture below is a APC SMT2200, a 2200VA 2000 Watt UPS. And yes, it’s on a 20 amp circuit. Heck, after all the trouble we had to go through, I now have more 20 amp circuits and outlets that I can possibly use in the next few years. That is, until the first round of huge expansion, I bet. The fan is always on but it whispers and doesn’t bother me at all. It was a biatch to get that thing into the office, though. The poor lady from UPS had a hard time getting the thing out of her truck, and even harder time (though that might have been because I helped) getting it on the dolly to get it in through the door. Then it was up to me to get the thing out of the box. Not easy since the thing is like 140 pounds. After opening it up and getting the two huge batteries out it was still heavy but I could carry it upstairs and re-assemble it. However, because of the high-pyle carpet it is impossible to move it around if needed so I took a shelf and some casters and created a solution. I’ll need to turn the shelf black at some point because the white doesn’t look too good. But for now, that’ll do. Yes, you are seeing an air-conditioning unit there. In addition to the 6000 watt central AC in the home I have added a portable unit for some extra cooling that helps with more local cooling. It’s loud. Very loud. Time to fire up iTunes and put on the headphone when using that thing. But it does help with boosting the cooling down to 75F in the home office. One of the other work “islands” that will remain empty until I get the rest of the office (the 6.0 office) here. 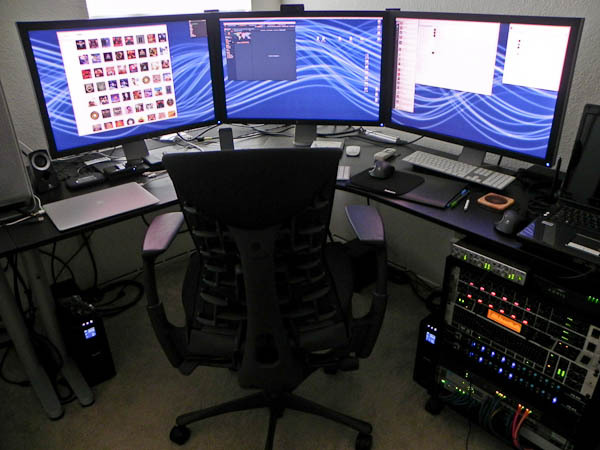 It’ll have three systems below the desk along with 4 of the 24″ monitors. And a few other things, of course. The other great thing about the new office space is that I have quite a bit of storage space with four large sliding doors. 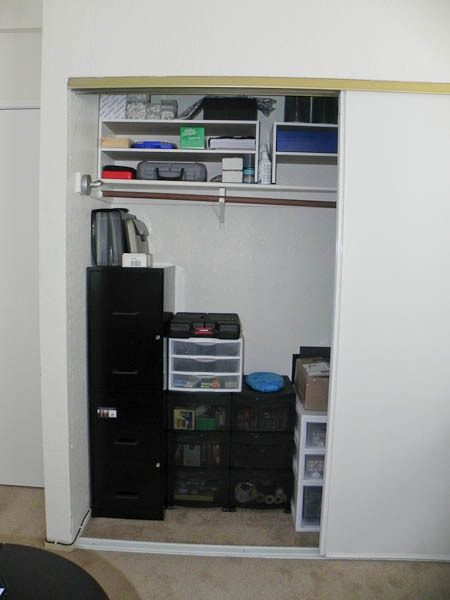 A good place to store all those handy cables and office supplies without having them scattered all over the office and cluttering the desks. I still wonder what fun thing I am going to do with that nook up there at the ceiling. It is just screaming to me that something fun needs to be done with that area. A view from the back and side. Just in case you wanted one! 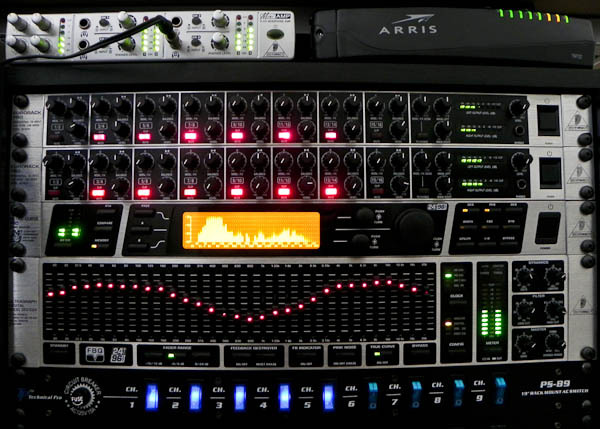 The top half of the rack with the audio equipment and its power switches. 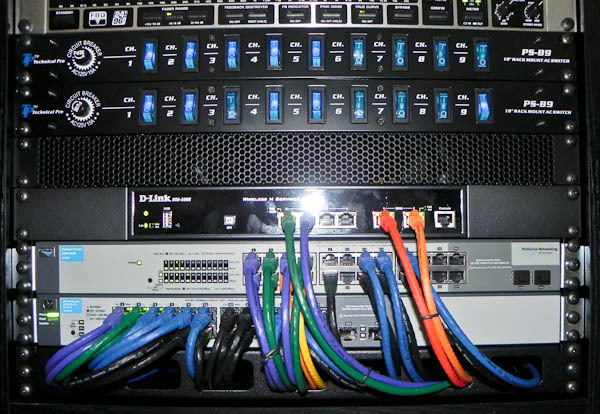 The bottom half of the rack with the (UPS powered, by an APC 1500VA) network equipment. 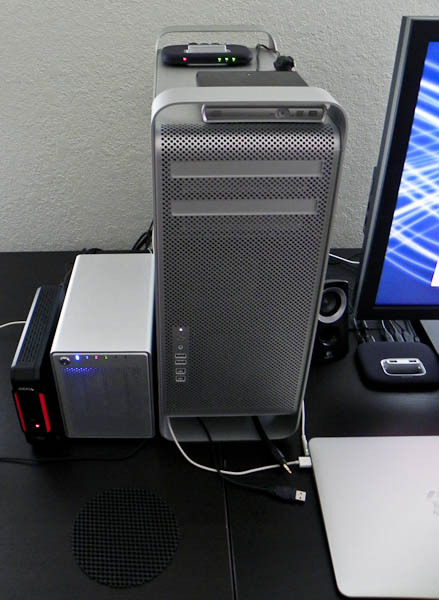 The thing currently powering the 3 x 30″ Dell U3011 monitors, a Mac Pro, yes! As I said, I am still waiting for the other systems to be built and delivered. But the cables for all those systems are pretty much ready to rock. There’s a 12TB Mercury Elite Pro QX2 there for the backups and RAID5 storage. I originally wanted to do an Areca SAS controller but decided I’ll skip boosting the Mac Pro until the new Mac Pro’s are available, you know, the Sandy Bridge 12 (or more) core systems with ThunderBolt. Until that time I’m not going to spend too much more dough on the Mac stuff. I just had to bite the bullet on this one because it was starting to be clear that the new models would not arrive soon enough for my needs. 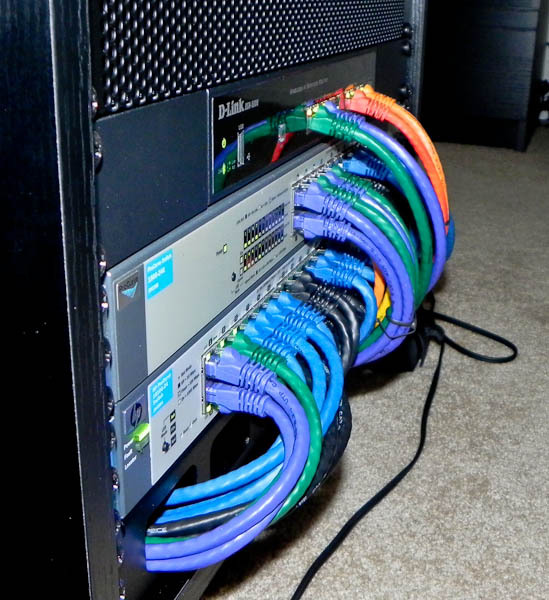 Cables.. Let’s talk cable management for a bit here, ok… I know you’ve been dying to hear about it. Better yet, I just made some pictures to illustrate what it is I do to keep the cables from dangling everywhere and getting caught into the typical web that you see almost everywhere a computer is involved. The trick I am using is real simple. Velcro, for starters. But I’ve explained that before. 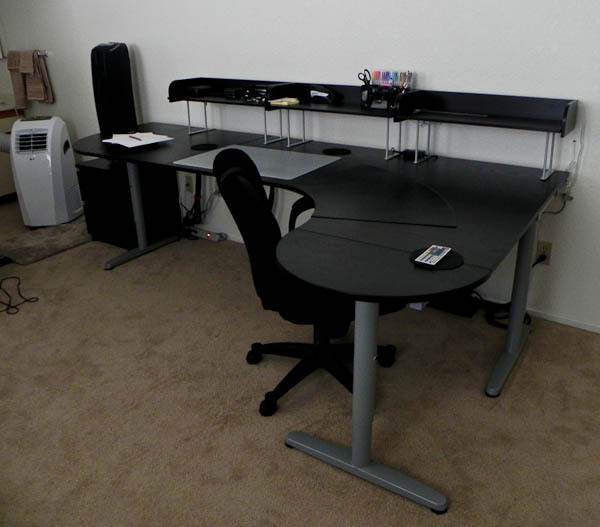 But to get things going with the Ikea Galant desks I just went to Amazon and ordered a bunch of plastic towel racks. Modified them with the Dremel to get some screw holes going and then just screwed them into the desks at the back end. In addition to that I went to Lowe’s and picked up two dozen little handles that you can screw on drawers. Well, I screwed them near the back of the desks as guides to hang and tie the velcro rings on. As for Velcro, just get a bunch of rolls from Monoprice. You can never have enough Velcro. Ever. Really. 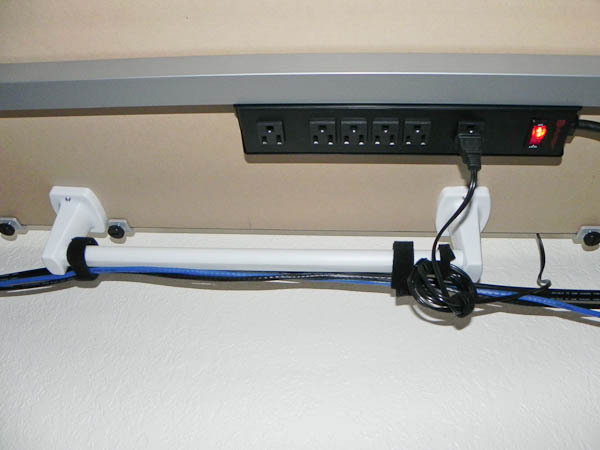 Also useful, some extra heavy duty 3-prong PDU’s. Again, just mount them under the desk. As you can see, the results are pretty good. Still some work to be done but so far I’m pleased with the results. 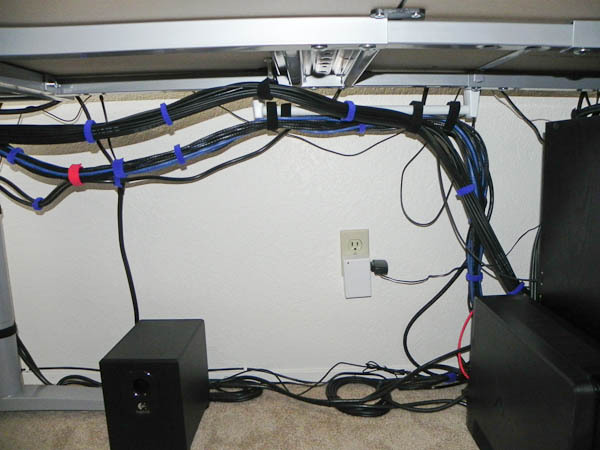 Lots of cable loops to bundle the professional audio cables and all the CAT6 network cables that run under that portion of those desks. 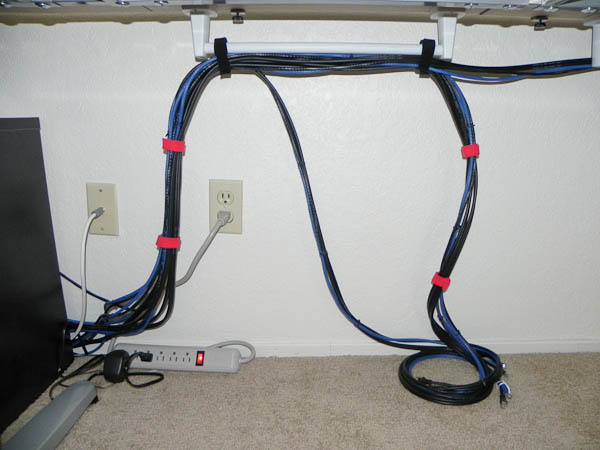 I am using blue Velcro to group cables into bundles and then some red Velcro to bundle larger bundles together. 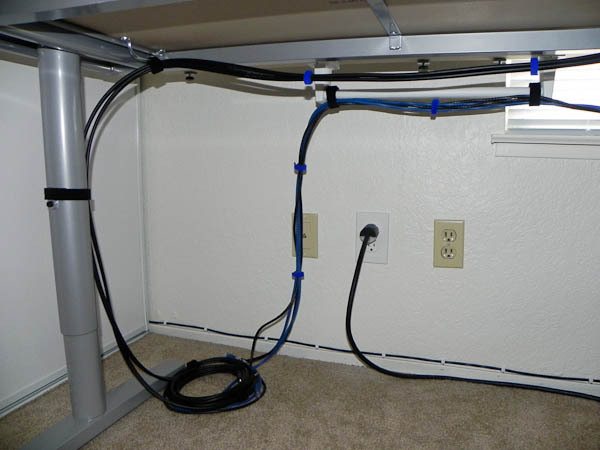 This identifies the path of the cables and means you don’t have to always use the rails or handles to create Velcro loops but rather use a cable bundle as a guide for more bundling. OK, that’s all folks. More later. It’s a Raxxess Economy Rack 12U. There’s a lot of places that sell those if you google around a bit. Cheap, effective. Had to order the casters separately and mount them because they don’t come with any. 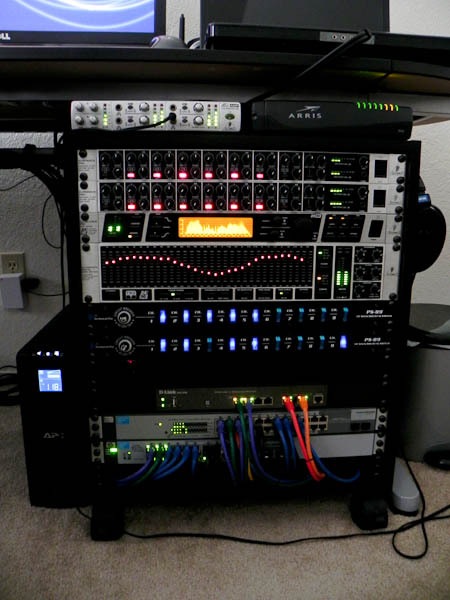 Years ago, I managed to pick up a 42U rack from a materials salvager for $150. It was overkill, but I couldn’t find any used half-height racks when I was looking. I’m going to buy those deck too, looking really great and it’s exactly what i was looking for. 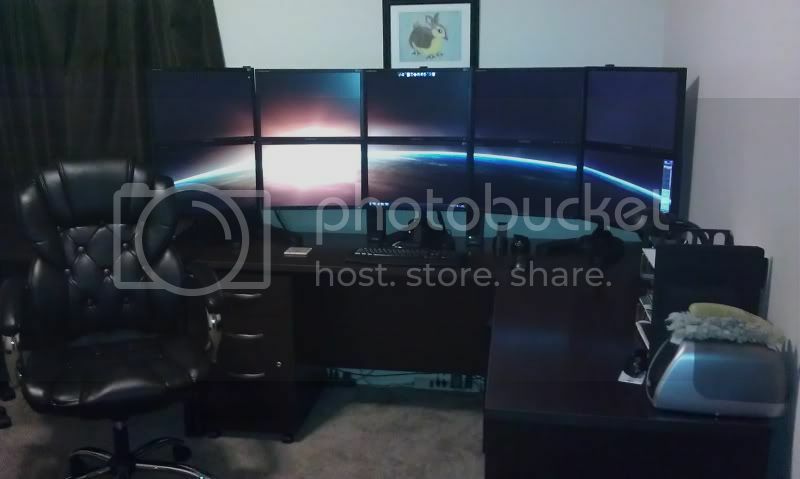 Any chance to have some new picture of your home Office. You and Tom gave me some great idea ! Probably not until somewhere very early next year. Nothing has changed (except for adding a maxed out MacBook Pro Retina) in the office because I haven’t been doing much and will need to tend to shipping and moving the rest of the other office across the planet in the next 2 months. So with luck it’ll all be complete late December or somewhere in Januari. 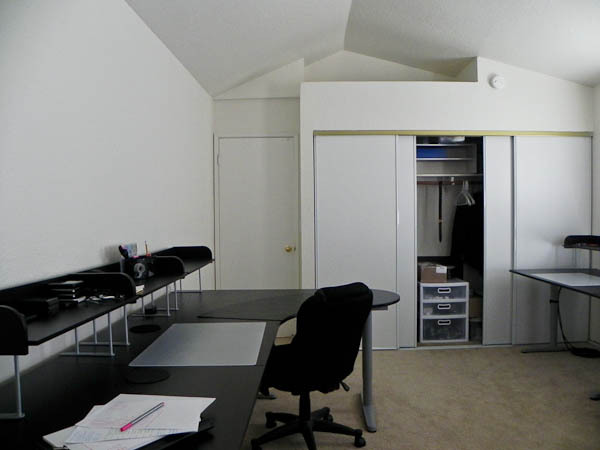 you should do some cove lighting in that nook..kinda like ambient light.. when working late it would look nice! Keep up the awesome work. I can’t wait to see what else you come up with. Maybe try some ambient LED lighting in the alcove? This is not a home office. 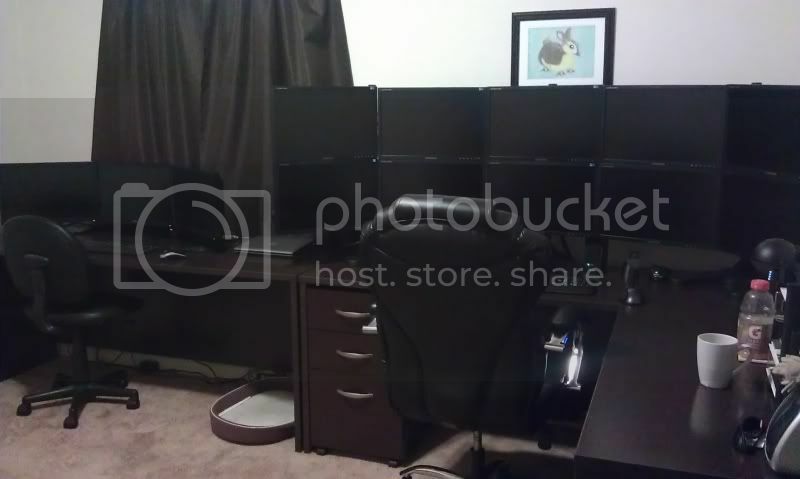 This is the entire data center admin’s office. This is what dreams are made of. 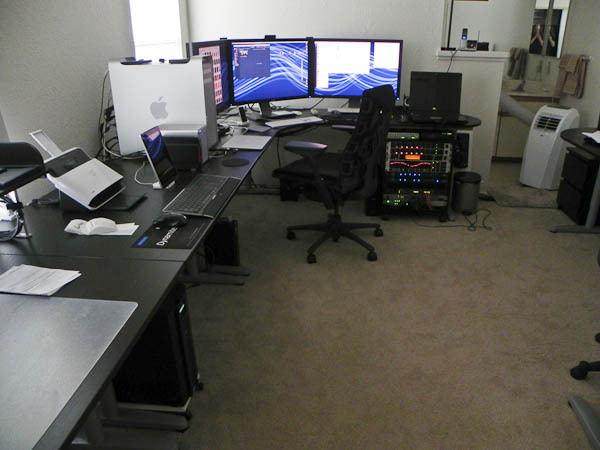 I do agree with the ambient lighting ideas, i hate overhead lights when on my comp at night. Alas, id hate to pay your power bill. you seem to be the perfect gentlemen…why do you portray this image…cuz I seem to like you but will like you more if you disclosed your fouls since you human. wow,,the networking is such a beauty “pearl” the assemblement,well craftiness,thumbs up to the network team..yet you seem to not like cisco. gadgets.